Our newly added Suites offer both the luxury and seclusion you desire during your stay in Monteverde. 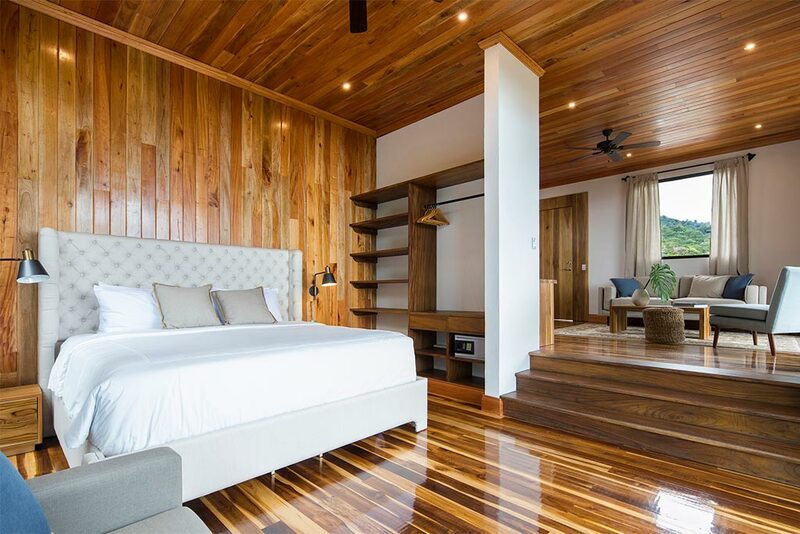 It’s 100 sq mts feature a large bedroom with hardwood finishing’s, with a king size bed and lounge area, ample closet space, and double exposure floor to ceiling windows with views of the forest and the Nicoya Peninsula. This room also includes an ensuite, fully furnished living area with a private bar and writing desk; as well as a spa style bathroom with a forest view shower, a small indoor garden, an adjacent sitting area, and a double vanity. Providing unparalleled access to the natural surroundings, this suite also features a 25 sq. mts terrace with a full-size daybed and a whirlpool Jacuzzi.